Comedy writer and middle daughter of Al Gore, Kristin Gore has written a funny and moving debut novel about life on Capitol Hill as seen through the eyes of Samantha Joyce, a 26-year-old health care analyst to Ohio Junior Senator Robert Gary. Hard working, idealistic, extremely competent, as well as neurotic and prone to daydreaming, Sammy, as she's known to her friends, has little time for anything, much less a relationship. But in the midst of lobbying and late-night dinners at the office, she meets Aaron Driver, who is hot, smart, and sweet, and who, after a night of binge drinking at a bachelor party, proclaims his love for her. But how will Sammy balance her 70-plus hour weeks with her budding romance, while keeping her best friend's slimy boyfriend from hitting on her, and making time for family, who insist her outfits match the centerpiece? I was looking forward to listening to what I thought would be an amusing story from a former comedy writer. Instead, after listening for an hour, this became the first book from Audible I could not finish. The author tries much too hard to make her main character, Sammy, quirky and funny, but her efforts fall flat. Sammy is just plain weird and the long winded health care policy lectures served to only slow down the narrative. In the beginning of the book, the character is rushing to get ready for work when she starts wondering what it would be like to have the use of only one arm. So she ties up one arm so she can't use it. When she arrives at work, one of her co-workers notices that she is wearing one sneaker and one sandal. Apparently she couldn't turn on her closet light with only one arm, so couldn't see her shoes when she was getting dressed. Stop and think - just how did she tie the shoelaces on the shoe and buckle the strap of the sandal with one hand? Could she not feel that these were completely different shoes? And she goes all day without changing shoes! Can you imagine how uncomfortable that would be? This sloppy writing and a totally unappealing main character were enough to make me abandon this one. I suggest that you do the same. The narration was just average as well. I love the typical chick lit - this is anything but typical. It's fun and silly and off the normal path (formula). I have read it once and listed multiple times and will again. Love this. The "cuteness" of the character just got rather silly after a while. Loved it -- both the writing and the narrating. Can't wait for another winner from Kristin Gore. Or has she already published another? Having read the reviews when this novel was released, I was looking forward to a light-hearted and entertaining listen. Unfortunately, what I received was a heavy-handed lecture on health care policy from an apparently brainless woman. I was incredulous from the beginning, over the lead character's ridiculous behavior. Does anyone really tie up one's arm, pretending it was broken, and then manage to hobble along with two different types of shoes all day? Instead of being amused at her "charming" imagination, I was just plain irritated with her apparent stupidity and lack of focus. If she was my employee, I would have fired her, and that's what I did with this book. A waste of a credit, and the first audible book I just couldn't finish. What a funny book! never "trying to be funny", the humour is often quite subtle, but case sos many smiles, chuskles and full blown laughs, it was a great book!!! No, it's not an intense drama about DC life or the funniest book I've ever read but it was enjoyable nonetheless. Yes, the character pretends she's armless, blind and stricken with various other anomalies but who of us haven't wondered what life would be like if we were stricken? So Sammy plays them out a little. She's a young girl living on her own in a new and fast paced situation and she has a hard time thinking she's worthy of such a position. It's comical and I found myself laughing several times on my way to work - that itself has to be a feat! She does get in some sneaky political statements but they even tend to provoke a smile. It's great for a lighthearted listen. 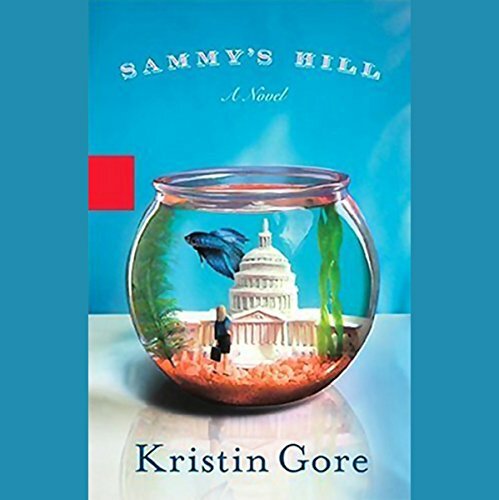 With Sammy's Hill, Kristin Gore has proven that she can move from story writer of the greatest television show in history (obviously - Futurama), to novelist in just a couple years. Her main character is charmingly quirky and you can't help realizing you are very similar to her in so many of her quirks. The politics/storyline are also termendous fun, if, as her character is, a bit too fanciful. As we've learned so recently, the good guys don't always come out on top when it comes to politics, and selling a progressive agenda to the American people doesn't always work out. If you're a raving convervative, you will be likely be offended and turned off by Ms. Gore's idealism and politics, so you might want to steer clear of this one. The narration is very well done and a delight to listen to, very complimentary of the writing. All in all this is a wonderful novel, and lets us know we can expect more great things from Ms. Gore as time goes on. Hopefully Futurama gets a second life somehow, as well as Ms. Gore's relatives! Very good listen all around! I'm always please to see an unabridged book added to the library. I was hesitant about this one though, as its author was potentially published due to celebrity instead of talent. However, this book was well narrated and well written. In fact, I would listen to a sequel. Except for a few over the top liberal rants & raves that were a little too political for a romantic comedy (even one about D.C. staffers!) I give this book TWO THUMBS UP.